Though seemingly simple and safe, jugging ropes, like rappelling, is one of climbing’s most insidious killers. 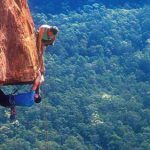 The good news is that, as with rappelling, a few simple precautions can minimize the risk. 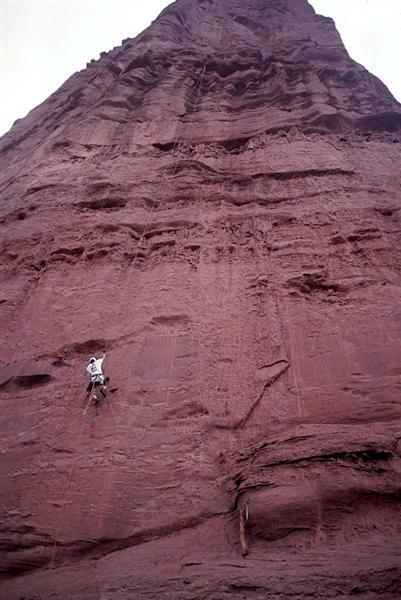 Pete Takeda yamming up fixed ropes on the Titan’s Naked Lunch (VI A4 5.10). Photo: Duane Raleigh. Any ascender can accidentally pop off a climbing rope. 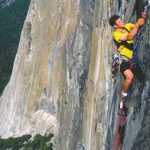 It can happen in any scenario, but is most likely to occur when the rope is strung horizontally, such as out a roof or across a traverse, both more technically challenging scenarios than that presented by a vertical hanging rope. 1. Sideways jugging is awkward and strenuous, making you more apt to screw up. 2. A laterally strung rope can torque your ascenders, possibly squeezing the rope through the gap between the ascender cam and frame. Make sure your ascenders and the rope you are jugging are compatible—some aren’t (follow manufacturer’s; instructions). 3. Cleaning a sideways pitch, or passing a knot, involves constantly removing the top ascender and jumping it past a piece or knot. The frequency of removing and replacing ascenders increases the odds you’ll bodger it and not properly reattach an ascender. Worse still, whenever you remove one ascender, you are left hanging from just one jug. If it comes off the rope … Adios. For starters, stay tied into the end of the rope. 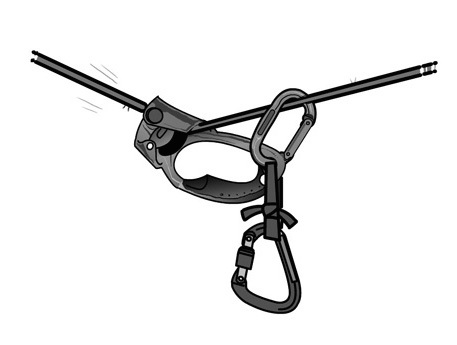 This knot is your emergency chute—even if both ascenders come off the rope. Assuming the distance to the end of the rope is less than the distance to the ground or a ledge, you’ll probably live. If the climber on the Trip this summer had tied in, he would be alive today, with one whopper of a free fall to talk about. In addition, always clip into a series of backup knots as you jug. Clip a locking carabiner to your belay/rappel loop, or through your leg-loop crotch strap and waist belt. Next, tie a figure-eight-on-a-bight in the rope just below your bottom ascender, and clip into this. As you jug, tie another knot every 30 or so feet, and clip it to the locker (Figure 1). Now, the maximum you can fall is 60 feet (twice the length of the 30-foot backup loop). If you are cleaning above a ledge, shorten your backup loop as necessary to avoid a literal smackdown. Figure 1. A proper backup means tying into the end of the rope and clipping to a knot in the rope just below your bottom jug. (Aiders omitted for clarity.) Illustration by Jeremy Collins. Figure 2. Use a prusik as a backup on a rope fixed at both ends. Illustration by Jeremy Collins. 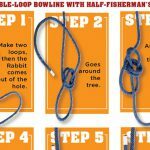 Backup knots work fine as long as the rope isn’t anchored on the bottom end. When the rope is anchored, or when the weight of numerous hanging ropes makes a knot backup impractical, set a prusik on the rope just above your bottom ascender, and clip it directly to your bottom jug (Figure 2). Some ascenders, such as the Petzl Ascension, have a clip-in hole at the top of the frame expressly for this purpose. Now, even if both ascenders mysteriously hop off the rope, the prusik will engage and catch you. Ideally, your bottom ascender will automatically push the prusik up as you go, but you may have to tinker with it to find the point where the prusik is loose enough to scoot but tight enough to cinch. As a final precaution, to help prevent your ascenders from torquing off the rope, especially on a diagonaling line, clip a carabiner to each ascender’s frame, then clip the biner around the rope (Figure 3). Figure 3. 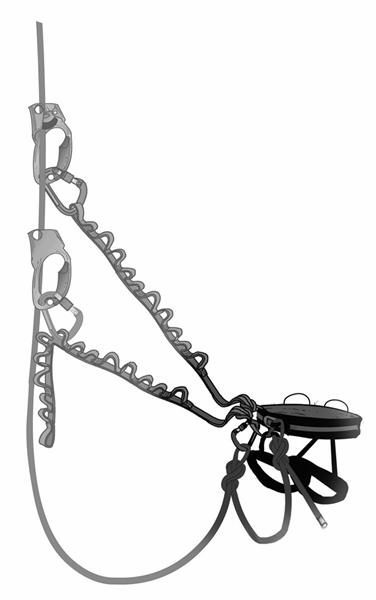 To prevent an ascender from torquing off a rope that runs laterally, clip a carabiner through the frame as shown. certain ascenders, such as the one here, have a carabiner hole in the frame above the cam. Clip a carabiner through this hole to lock the ascender on the rope. Illustration by Jeremy Collins. Some climbers prefer to rig one ascender on top and use a Petzl Grigri as the bottom “ascender.” This method provides greater safety than two ascenders, since a Grigri can’t come off the rope and is recommended for cleaning traverses and diagonaling pitches. However, any system, including this one, is fallible—always tie into the end of the rope and use an additional backup knot. 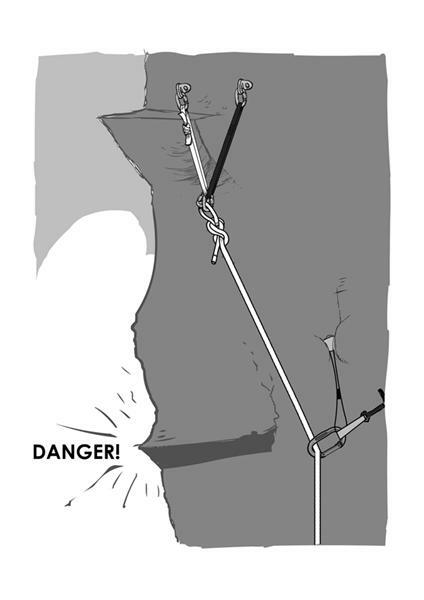 The disadvantage of the Grigri is that it takes longer to attach and remove from the rope than an ascender. Another method calls for two ascenders, per normal, and a Grigri on the rope just below the bottom ascender. Here, the Grigri replaces the backup knots—because it automatically moves with you, you save time by not having to constantly stop and tie those pesky knots. But it is easy to accidentally rig the Grigri upside down, making it a backup in name only. Also, the Grigri can tangle in your rack and possibly jam open. Backup knots and prusiks are safer. Until recently, when I finally replaced my jugging rig, it was a tattered arrangement of slings and aiders, faded relics of the neon 1980s. Stupid, stupid, stupid. The slings and daisy chains that connect you to your ascenders are as critical as the rope itself. Keep them in top shape and upgrade as necessary. Also, keep your ascenders in proper working condition. Safety springs and cams wear out. Sticky cams and safety triggers are accidents waiting to happen. Use a locking carabiner for every link in the system, and make sure the locking mechanisms really lock—i.e., double-check your “self-lockers” before you weight the line. As you sproing up the rope, alternately weighting each ascender, the rope stretches, then rebounds. This up-and-down action very effectively saws your taut cord across the rock. 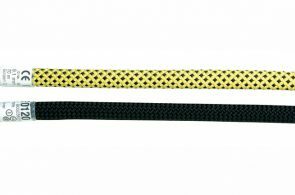 Protect your rope—and yourself—by jugging as smoothly as possible. 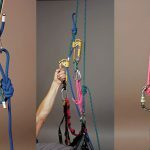 With practice, and a fine-tuned jugging rig, where all the ancillary components are adjusted precisely to your anatomy and style, you can climb a rope with minimal bouncing. Good style and a good system are critical when you jug a fixed, free-hanging line. In this situation, the rope bounces a lot, with your entire body weight potentially grating the cord across an edge. Smooth over abrasive bulges or edges that can cut the rope. In most cases, the rope-cutting culprit is just below the anchor, where the rope makes its initial contact with the stone. Packs, gloves and shirts slid between rope and rock make for effective rope protectors—I’ve even used my foot to keep the rope off an edge while I was at a belay, waiting for my partner to jug-clean a pitch. Duct tape works well for covering edges, just be sure to remove it afterward. On numerous El Cap pitches, “fixed” duct tape blows in the breeze like used toilet paper. Some companies, such as Spiroll (spirolls.com), make specialized rope protectors, which “burrito” around the rope. Another good technique is to use directionals to pull the fixed rope away from edges. Place pieces of protection off to the side of potential rope eaters, and clip the rope to the pro to direct it out of harm’s way (Figure 4). 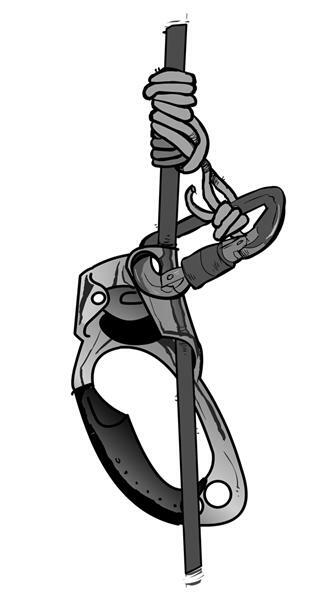 Strategically unclipping the rope from protection, or shortening or lengthening slings, can sometimes achieve the same effect. Last, fix with fat, 11mm ropes, which have durable sheaths meant for abuse. Big walls are no place for wimpy sport lines. Also consider static fixing ropes. 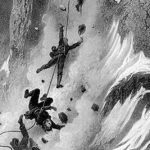 Built primarily for the rigors of caving, static ropes have tougher sheaths than dynamic climbing ropes, and, because they have virtually zero stretch, eliminate most of the sawing action inherent to jugging. The downside to using static cords is, of course, that they don’t stretch. 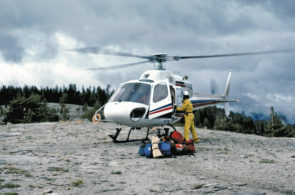 Even a short fall onto a backup knot on a static rope can cause severe shock loading. Most jugging accidents are caused by pilot error. Learn your system inside and out. 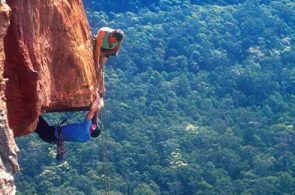 Practice at a short, safe crag or in a tree, where, removed from the intimidating environment of a big wall, you can concentrate on dialing everything in. Train yourself to listen for the audible “click” of the ascender safety engaging, and visually confirm that each ascender is properly set and locked. On the rock, take every possible precaution: Double-check your system each time you launch out onto the jugs, and you’ll make those SAR folks, like the Maytag repair man, will happily become the loneliest people in town. You don’t have to have an apple konk you on the head to realize that as climbers our greatest enemy is gravity, and that gravity’s minion is weight. Defeating gravity by getting lighter, both in terms of ourselves and our gear, is in fact one of our favorite pastimes. Toproping is so safe it’s virtually foolproof, right? Think again. Just a brief belay lapse can produce high loads, testing the holding power of your gear. In this week’s Climb Safe, Rock and Ice field-tests real-world climbing scenarios. Yosemite seems like a fair-weather paradise, but because it sits high in the Sierra Nevada and close to the Pacific Ocean, cold, wet storms can strike any time. Bad weather and lack of preparedness can be a deadly combination. Here’s how you can avoid becoming a Valley statistic.